LISBON — A phone call from an alert desk clerk at the Days Inn resulted in drugs being found in one of the motel rooms Monday morning. Police Chief Mike Abraham said the clerk called at 9:15 a.m. to say a man wandered out of a first-floor room with his pants down around his ankles and acting disoriented. The man, later identified as 46-year-old Ben E. Eastham, was found next door behind the BP gas station, still acting confused and swatting at something in the air and picking things up off the ground. Eastham was able to tell police he was staying at the motel with an unidentified woman, who rented the room but had since left. When a used syringe was found on Eastham, Abraham decided to go to the room and called the Columbiana County Drug Task Force for assistance. A motel housekeeper knocked on the door and a man later identified as Kendall Lamont Smith Jr. opened the door, “Mr. Smith saw me in uniform and tried to shut the door on us,” Abraham said. 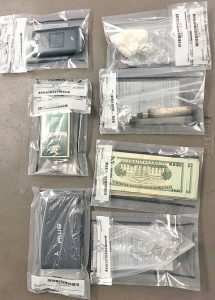 Police prevented him from doing that, and once inside DTF agents found heroin and crack cocaine in Smith’s pants pockets, along with about $1,400 in cash. The 24-year-old Smith, who is from Youngstown but living in Wellsville with Eastham, was charged with obstructing police business for trying to prevent police from entering the motel room. Abraham said other charges are pending against Smith and Eastham, both of whom were known by police as suspected drug dealers. Abraham thanked the staff at the Days Inn for recognizing something was not right and calling the police department. “That’s not the type of clients they want out there. They run a decent motel,” he said.